Latest: The third phase of Dubai Tour begins today (Friday), which will pass through Dubai International Marine Club to Hatta Dam. The distance covered will be 172 kilometres. Expect delay at Al Sufouh Street, the side coming from Dubai International Marine Sports Club to the intersection of Madinat Jumeirah from 10.15 to 11.05 am on Friday. Please use Sheikh Zayed Road. Expect delay at Umm Suqeim Street, the side coming from the intersection of Madinat Jumeirah to Al Khail Road from 10.30 to 10.50 am. Please use Hessa Street. Expect delay at Al Khail Road, the side coming from Umm Suqeim Street to Bu Khedra Bridge from 10.40 to 11.35 am on Friday. 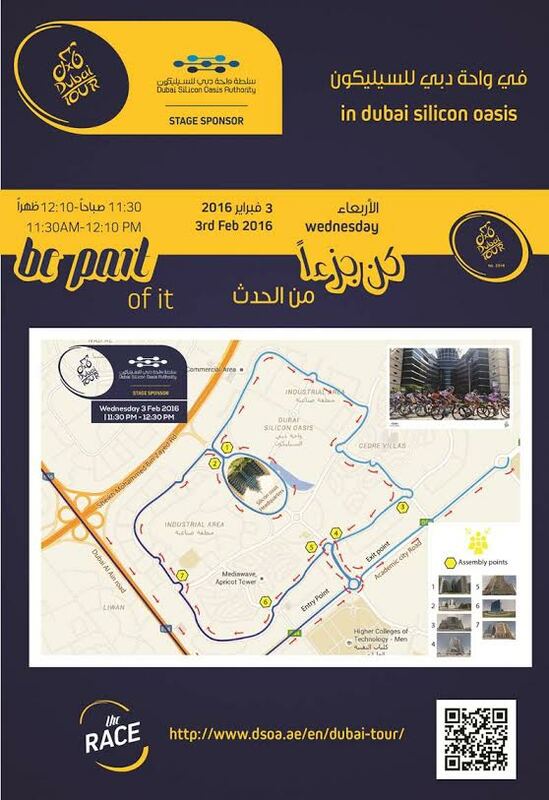 Please use First Al Khail Road, Al Asayel Street, Sheikh Zayed Road and Mohamed Bin Zayed Road. Expect delay at Ras Al Khor, the side coming from Abou Kudra Bridge to Al Aweer Bridge from 11.00 am to 12.10 pm on Friday. Please use Al Manama Street. Expect delay at Al Aweer Road, the side coming from Al Aweer Bridge to the Lehbab Roundabout from 11.30 am to 12.49 pm on Friday. Please use Dubai Al Ain Road and Al Manama Road. Expect delay at Hatta Oman Road, the side coming from Lehbab Roundabout to Al Madam Roundabout from 12.00 to 01.10 pm on Friday. Please use Dubai Al Ain Road. At 10.45am, Dubai Police tweeted traffic was building up from the seventh bridge Sheikh Zayed Road to Dubai-Al Ain Road. The traffic build up is in the direction of Al Lisaili Bridge. Around the same time, the police also tweeted of traffic on Al Sufouh Road towards Marina, along with Sheikh Zayed Road, Jabel Ali Road towards Lahbab. Expect delay at Al Sufouh Street, the side coming from Dubai International Marine Sports Club to Qarn Al Sabkha Road from 10.00 to 10.40 am. Please use Sheikh Zayed Road. Expect delay at Sheikh Zayed Road, the side coming from 5.50 Bridge to Jebel Ali Lehebab Street from 10.15 am to 11.00 am. Please use alternative roads: Al Sufooh Street and Sheikh Mohamed bin Zayed Road. Expect delay at Jebel Ali Lahbab Street, the side coming from Sheikh Zayed Road to Dubai-Al Ain road from 10.30 am to 12.15 pm. Kindly use alternative roads: Al Yalayis and Al Maktoum Airport Road. Expect delay at Dubai-Al Ain Road, the side coming from Jebel Ali Lehbab Bridge to Allesely Bridge from 11.30 am to 12.15 pm. Kindly use alternative roads: Al Aweer and Al Manama Road. Expect delay at Allesely Street, the side coming from Allesely Bridge to Al Qudra Street from 11.45 am to 12.50 pm. Expect delay at Emirates Road, the side coming from Al Qudra Street to Sheikh Hamdan Compound from 12.45 to 1.30 pm on Thursday. Use alternative roads: Mohamed bin Zayed Road. Expect delay at Al Qudra Street, the side coming from Allesely Street to Emirates Road from 12.00 to 1.15 pm on Thursday. Use alternative roads: Lahbab and Allesely Road. Expect delay at internal streets in Dubai Motor City area from 1.15 to 2.10 pm. Expect delay at internal streets of Jumeirah Golf Estate area from 1.25 to 2.25 pm. Expect delay at Hessa Street, the side coming from Sheikh Mohammed bin Zayed to Asayel Street from 1.45 pm and 2.30 pm on Thursday. Use alternative roads: Umm Sequeim and Al Naseem Road. Expect delay at Al Asayel Street, Qarn Al Sabkha Street, Al Naseem Street and Al Falaq Street between 2 pm and 3.15 pm on Thursday. Traffic is back to normal in Dubai, Dubai Police said in a tweet. Expect delays at Al Khail Road, between Meydan Road to Ras Al Khor Road. Use First Al Khail Street - Al Asayel Street- Sheikh Zayed Road - Sheikh Mohammed bin Zayed Road - from 10.40 am to 11.30 am, the RTA said. The first phase of Dubai Tour 2016 starts today, with Roads and Transport Authority (RTA) announcing an expected delay at Al Sufouh Road, urging motorists to use Sheikh Zayed Road. The side coming from Dubai International Marine Sports Club towards the intersection of Madinat Jumeerah between 10.15am to 11am. Expect delay at Emirates Road as well, primarily for the side coming from Al Aweer Bridge to Sharjah. Use Sheikh Mohammed bin Zayed Road as an alternative between 11.50 am to 12.50 pm, the RTA said. 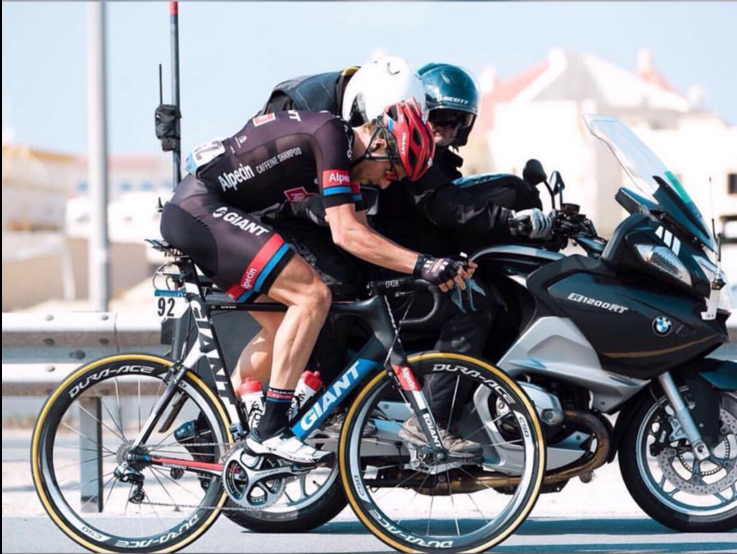 Roads in the Jumeirah Islands and Palm Jumeirah communities will be partly closed for the Dubai Tour 2016, a professional cycling race that will take place from Wednesday (February 3) until Saturday (February 6). Covering 671 kilometres over four stages, the event features 128 competitors. Among the teams are Team Wiggins, led by three-time Olympic Gold winner Sir Bradley Wiggins, the Al Nasr Pro Cycling Team and the Skve Dubai Pro Cycling Team. 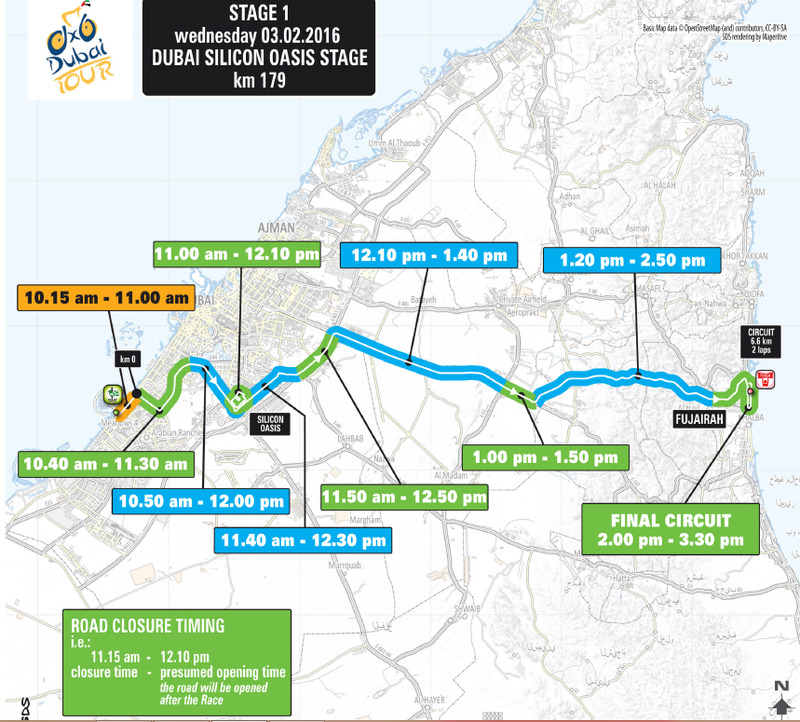 The Nakheel Stage, on Day 2 (Thursday, February 4) passes through Jumeirah Islands and Palm Jumeirah communities as part of the 188 kilometre route, which starts at Dubai International Marine Club and finishes at Atlantis The Palm. “Please be aware that some roads within these communities will be affected. Any road closures or diversions will be co-ordinated by the appropriate Dubai authorities, with Dubai Police escorting the cyclists on all routes throughout the race,” Nakheel said in an email to homeowners. “While every effort will be made to minimise disruption, we urge you to take the route and timings into account when planning journeys,” it added. The tour, which will be broadcast live on TV channels across the world, is organised by the Dubai Sports Council in partnership with RCS Sports and Events DMCC. 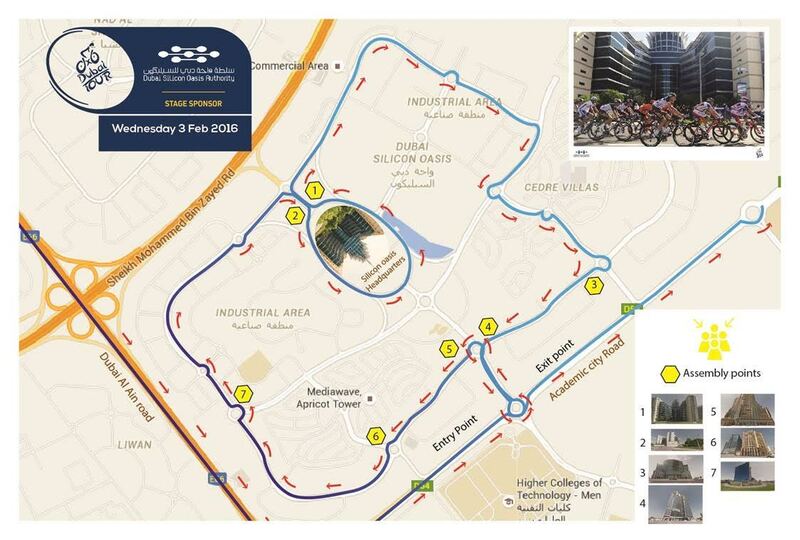 The race routes in Dubai Silicon Oasis will be closed by Dubai Police, as shown in the attached map, from 11am to 12.15 pm on February 3.